Keeping track of latest Tweets just became a lot easier as a result of a renewed deal between Google and Twitter, which went live this week. You can read the details of the renewed deal in Google’s official announcement, but the short version relevant to social media marketers is that Tweets will now show up in a prominent spot in mobile Google search results. These changes only affect mobile searches, and are currently rolled out exclusively to users in United States searching up English queries within the Google app (iOS and Android) and mobile web. 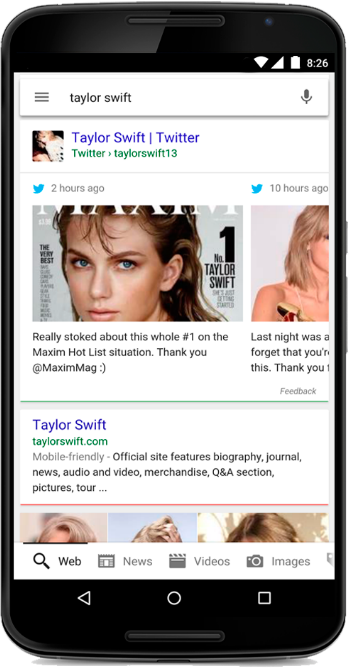 On the business side, the partnership means that Google once again has full access to Twitter’s “firehose” of real-time Tweets, which allows its search algorithm to pick out the most popular Tweets, or those most relevant to the search query. For Twitter, this deal brings an increased visibility of content, and a chance to reach users who don’t have an account with the network. After taking a look at the early examples of this new cross-platform feature, we thought it’d be useful to revisit some strategy points that can play into higher visibility for your brand. Here are some ways in which the Google-Twitter deal can influence your company’s social media strategy, and how you can use these changes to your advantage. What’s the first thing that strikes you when you see this sample screenshot of Tweets in Google search results? If you thought, “Every top Tweet has an image,” we’re on the same page. We’ve discussed how much images in Tweets help increase engagement and clickthrough rates on Twitter; now, the latest deal between Twitter and Google may mean that media-rich Tweets will increase your chances of getting views outside of the network. When reporting on the renewed deal, social media experts note the biggest advantage for Twitter is reaching the so-called “logged out” users—people who view content on the microblogging network without ever making an account—and hopefully turning some of them into active Twitter audience members. A similar advantage is presented to the authors of Tweets that show up as top Google search results: this is an unexpected bonus outlet to reach new audiences. It doesn’t mean, however, that no work is required on your part because your Tweets still have to receive enough engagement natively to rank as “popular content” for Google. Thus, take time to evaluate your current Twitter media strategy, and see if there’s room for improvement. Image Tweets aren’t the only opportunity for your brand’s social account to get noticed. With the renewed deal, content from Twitter is displayed in a carousel—in contrast with Google’s standard card-style news results—with the account name on top and the social message below. So if someone sees your Tweet among the search results on a trending topic or your industry, they can glean quite a bit of information about your social account right away: the Twitter handle, the profile pic, and the time the displayed Tweet was posted. It’s crucial that what they see accurately represents your brand, so take a good look at your public-facing assets to make sure they’re up to par. This is likely to hint at the fact that currently trending topics may show up as the top search result on Google’s mobile app, assuming that the latest developments or reactions to a story will be found on the social channels. Thus, if your brand has something meaningful to add to a discussion of a trending topic, your Tweets containing the appropriate keyword or hashtag have a chance of showing up when that topic is searched. To maximize your chances of showing up in the Tweet carousel on Google, revisit some strategies on how to write engaging Tweets, as well as research and use trending hashtags wisely. In addition to just seeing the Tweets show up in search results, you might want to explore the content directly on the social network. 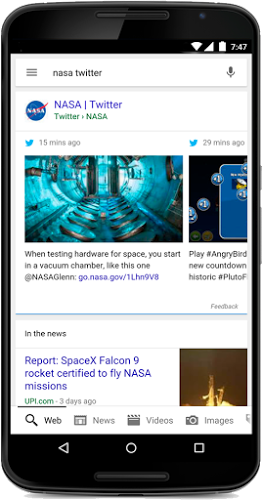 If you’re looking to follow the latest developments on a trending topic on social media, Google redirects users to view the displayed Tweet results in Twitter’s mobile app or the mobile web version. This part of the new Google-Twitter deal plays into Twitter’s ongoing efforts to increase the reach of content from the network. If these logged-out users are visiting your brand’s Twitter page, thanks to Google, you might want to check how a mobile audience would see your page. All the profiles on the new Twitter mobile app are responsive, but not all cover photos would look ideal on a smaller screen. Plus, keep in mind that your Tweet conversations won’t be separated from the main stream, so you want to remember to heed the basic rules of netiquette to make the best first impression on new visitors to your page.